High-definition displays can be divided into the two main components that make up the display. The mainboard receives high-definition video from a source such as a set-top box, Blu-ray Player, or RF Tuner, and performs all the complex processing such as de-interlacing, scaling, color conversions, 3D unpacking, and much more. The processed data is then transmitted over to a display where the video is displayed and audio is generated for consumers to experience. The technology used to transfer the data between the mainboard and the display is a high-speed digital interface known as Low-Voltage Differential Signaling, or LVDS. Figure 1: Multimedia content is received by the HDTV mainboard where it is processed then transmitted to the front panel for display, speakers for audible sound, or generated out another port on the mainboard. High-Performance Video Generator –To properly assess the quality of the LVDS video being generated by the HDTV mainboard, it must be supplied with the highly accurate video signals that can stress all the components within the HDTV mainboard. For example, NTSC video inputs are used to validate the ADC and demodulation components while HDMI 1.4 generation will test the 3D video processing, de-interlacting, EDID negotiations, CEC communications, and more of the mainboard. High-Speed LVDS Analyzer – The LVDS analyzer is used to measure the overall picture quality of the processed images being transmitted to the display. There are a number of ways to test video quality, which will be addressed in the next section. Stereo or SPDIF Audio Analyzer – While the LVDS channels carry the pixel content of the image to be displayed, the audio content is also tested to ensure the mainboard did not introduce artifacts such as noise, drops, or distortions. High-Speed LVDS Generator – When the display is tested independently of the mainboard, video content must be supplied to the display by an LVDS generator. Engineers can easily detect errors such as dead pixels, poor clocking, or bad transistors by using a known high-definition video source. 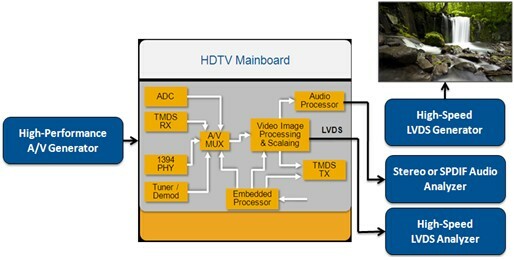 Figure 2: The four key components to a test system for HDTV mainboard and display are the video generator, LVDS analyzer, audio analyzer, and LVDS generator. While other components can be added to this architecture for RF video input, IR commands, power supply, or an HDMI analyzer, these four components make the backbone of the test system. The first method is aSignal Analysis such as a bit-error rate (BER). The benefit to a BER test is that it is low-cost and offers very fast test times for analyzing the LVDS signals. The challenge with this approach is that it does not provide any information about theimage content. The second method for video analysis is Static Image Analysis where a single image is acquired and analyzed for quality. Measurements on the line timing, color levels, image SNR, or others provide much more visibility to the engineer about the content being generated over the LVDS channels. The final method is to perform Picture Quality Analysis which analyzes dynamic video for artifacts that may not appear in every frame such as macroblocking, stuck video, pixellation, or motion blur. Picture quality analysis applies a pixel-to-pixel comparison against a reference image to produce a measurement on the perceived quality of the video content that is similar to the score a consumer would give. To continue driving down the cost of test, automating measurements for faster test time is important. What is equally important is designing a test system for parallel test of multiple HDTV mainboards and displays. National Instruments has worked closely with NI Certified Alliance Partner Alfamation to develop a set of solutions that meet the demand of these high-performance applications. With the PXI platform, engineers can have a low-footprint test system that scales as requirements change (e.g. adding RF video generation, IR simulation, or HDMI loop-through analysis). This system is developed using a single software platform such as NI LabVIEW or NI TestStand, reducing development costs for integrating multiple solutions with multiple APIs. Alfamation FlexMedia VG-01 Multi-Format Video Generator provides the stimulation required for HDTV mainboard testing. This module generates composite (PAL/NTSC), s-video, component analog video as well as VGA. It also supports HDMI 1.4 generation including 240Hz, 3D content, 4K2K resolution and CEC, EDID, ARC, and Ethernet capabilities. 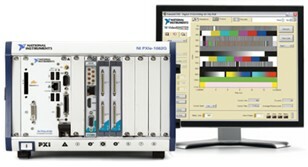 Alfamation FlexMedia VA-01 LVDS Analyzer offers 8 channels of LVDS acquisition and analysis with real-time analysis up to 25Gb/sec. Users can configure the analyzer bandwidth to test a single HDTV mainboard at 1080p240Hz or 4K2K resolution at 24Hz or configure the module for parallel test of four HDTV mainboards at 1080p60Hz or eight devices at 720p60. The VA-01 LVDS Analyzer can be paired with NI Picture Quality Analysis software to perform advanced measurements on perceived quality or set up for simple BER analysis. Alfamation FlexMedia VG-02 LVDS Generator supports 8 channels of LVDS video generation with capabilities up to 1080p240Hz and 3D structures. The module also contains a shutter glasses sync output for validating the 3D picture quality of the display with active shutter glasses. Figure 3: The FlexMedia VG-01 (left), FlexMedia VA-01 (middle) and FlexMedia VG-02 (right) provide the functionality needed to test the latest high-definition displays. In the same system, engineers can add audio analyzers, video analyzers, or any other modules necessary to customize their system.